Proving themselves to be the ultimate utilitarian consumer devices, smartphones are providing individuals untethered access to an increasingly wide range of personal devices. These range from computers and TVs to lights, heating and air conditioning and household appliances. Aiming to build a mass market for energy efficiency and clean energy, startups and established energy market players are rolling out a range of connected demand-response and demand-management products and services. They range from smart thermostats and home energy management apps to lighting controls, solar energy and battery storage systems. Coincidentally, social media platforms have benefited greatly from the drive to make broadband network connectivity ever-present. In short order they have come to be considered essential tools for public outreach, customer engagement and new business development. Sunnyvale, California-based Bidgely is capitalizing on the near ubiquity of smartphones, mobile devices and social media in building its home energy analytics business. It's also leveraging its ability to tap into, parse and process the massive amounts of data on consumer energy use collected by power utilities. Bidgely in recent months announced deals via which its cloud-based “customer engagement and utility intelligence” apps and analytics will be rolled out to some 1.5 million utility customers in Canada and the U.S. Customers include London Hydro, TXU Energy and the Energy Excelerator project with utilities in Hawaii. The key to Bidgely’s cloud-based, real-time energy analytics platform is its ability to “disaggregate” data on electricity usage within buildings and homes -- down to the level of individual appliances, equipment and devices -- without the need to install sensors or other hardware. That data can then be used to lower energy consumption and improve energy efficiency. By making that information accessible to home and building owners, it can also enhance customer engagement, or so the reasoning goes. Mobile and Web apps provide the essential end-user front-end to Bidgely's powerful back-end, software-as-a-service (SaaS) energy analytics. The company is gearing up for the launch of its HomeBeat Web and Mobile app, HomeBeat Energy Monitor and HomeBeat Agent at the DistribuTECH 2015 trade show to be held at the San Diego Convention Center Feb. 3-5. 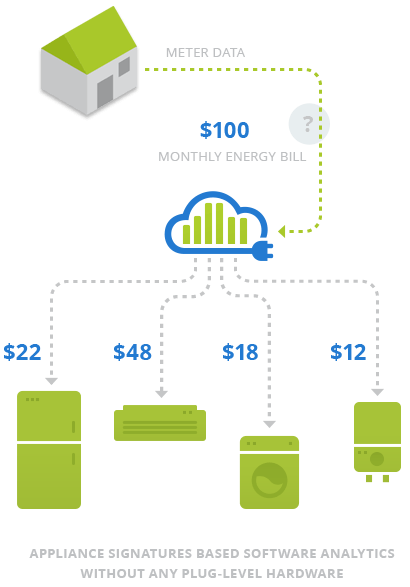 By tapping into and analyzing customer data collected by utilities, making use of Bidgely's home energy analytics platform does away with the need for utility customers to take the time or spend the money to have expensive sensors installed in their homes. “Bidgely is enabling a new wave of energy analytics and insights that is transforming utilities into trusted energy advisors for their customers,” CEO Abhay Gupta was quoted as saying. Beset and still behind the curve when it comes to solar, wind and distributed renewable energy generation, U.S. utilities are also struggling to find ways to capitalize on their investments in smart grid, demand response and demand-side management technology. Bidgely's cloud-based energy analytics platform can give them a leg-up, at least with regard to the latter. “Bidgely's new software and hardware offerings reflect the innovations that are increasingly helping utilities deepen customer relationships and improve the bottom line," Raymond James analyst Pavel Molchanov was quoted in the news release. "2015 is poised to be a notable year for technologies that allow utilities to further leverage their smart grid infrastructure and provide compelling new products and services to customers."